About a year ago, I decided that my Mac museum would be incompletewithout an iMac, whatwith it being the "computer that saved Apple" and all. I began browsingeBay with the intent of finding an original Bondi blue tray-loaderfor the collection. 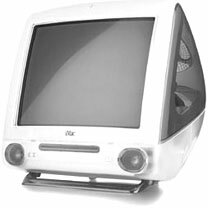 I hadn't really paid much attention recently to theold CRT iMacs, and I was caught a little off guard by how cheaply theycould be acquired. Various resellers on eBay wereselling whole flats of early tray-loading iMacs for well under $100 permachine (without keyboard or mouse). As a matter of fact, for anindividual iMac, shipping was often more expensive than the computeritself. Even slot-loaders were under a c-note, and I began to have theglimmerings of an idea. I mean, sure, a Bondi blue unit would be swellfor the museum, but some of those slot loaders had DVD drives, and I'mof the firm belief that a computer that can run OS X and has a DVDdrive, as well as USB and FireWire ports, is never really useless. Pretty soon I settled on a Graphite G3/400 DV SE andplaced a bid. I won the auction with a total outlay around a hundredbucks, shipping included, and the big box showed up on my doorstep. Thecomputer had arrived with a mismatched Bondi blue keyboard, a raspberryhockey puck mouse, and a pretty bare-bones install of Mac OS 9.Happy as a clam with my new acquisition, but not really sure what to dowith it, I set it up on the dresser in my bedroom where I could use itto watch DVD movies and as a bookshelf CD player. Not long after my move toIndiana, I started my experiment of doing all my computing on old Macs.I set up the iMac on my desk along with my G4 tower, figuring I coulduse it for . . . well, something, I was sure. I installedJaguar and a couple of old games on it and considered hooking it intothe network, but stringing 20' of Cat 5 to the router was too long of arun for too short of a slide. It mostly sat idle until I got my iPodnano. Now that I had an iPod, suddenly I wanted to rip all my CDs anddownload video from the 'net. I just didn't want to tie up my maindesktop doing it. The third-generation nano required Tiger to run -would the old iMac handle it? I installed OS X 10.4, and it ranfine. Now I had to get the older unit onto the network. After tying myselfin Gordian Knots of cable, I added a Hawking USB WiFi gizmo. Bam! I waspulling pages from the Web in no time flat. Of course, between the keyboard and the USB WiFi, I was now out ofUSB ports. I bought an inexpensive powered USB hub, and I was inbusiness! The addition of the powered hub solved another problem. I do all myphotography for my various blogs using an old Nikon Coolpix that takesCompact Flash cards, and I use a USB card reader to extract the photos.Since my G4 Sawtoothonly has the two USB ports, which were clogged with the Logitech mouseand keyboard, getting photos onto the computer involved disconnectingthe keyboard so I could hook up the card reader. Now I could just leavethe card reader hooked to the powered hub and extract images to theiMac. In a total reversal of fortune, the little iMac that I'd boughtbecause it was cheap so I could use it to play music and movies in mybedroom has become a vital part of my in-home network. It serves as themain portal for my iPod, handling the downloading of media from the Weband ripping CDs without interrupting productive work on my main desktopmachine. It also serves as a repository for all my photos. As the13 GB internal hard drive fills up, I can just add an externalFireWire drive for additional media storage, which would have the addedbonus of being able to be connected to either of the other Macs Icurrently use for work. Thanks to seamless networking and being able to mount its drive oneither my main desktop or laptop, it serves as an always-on photoserver, letting me post content no matter whether I'm blogging over myfirst cup of coffee on my desktop in the office or from the front porchwith my iBook, sipping a cold beer after mowing the lawn. When youconsider that the total outlay for the iMac was about the cost of twotanks of gas in this day and age, deals don't come much better thanthat. Really, a later slot-loading DVD CRT iMac makes a great utilityinfielder in any home network. They're compact and don't require aseparate monitor to get them up and running, plus they're dirt cheapand are convection-cooled quiet. All this makes them the SE/30 for the new generation: Cheapto acquire, able to run a modern OS and interface with a network, smallof footprint, and quiet of operation, they can be tucked away and usedas inexpensive servers long after the spec sheet says they're obsolete.